Marketing On The Internet Has Taken Off In Amazing Ways. This article has multiple thumbs up Internet marketing solutions. 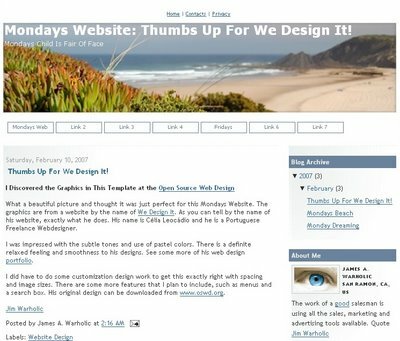 Google, Blogger, Open Source Web Sites, Website Designers, Marketing, Advertising, and Sales, for your business solution. Website designs, blog designs, website marketing, and blog marketing are making headlines these days. Why do I mention websites and blogs in the same sentence? The reason is because of the power that is in both. Just sit back for a moment and bear with me on my little story. Both of the following statements are true. There is no difference between a blog and a website. There are major differences between blogs and websites. In fact, we have a convergence going on online today between website marketing and blog marketing. Management at the highest level needs to throw out their misconceptions for understanding about blogs vs websites. Blogs are powerful websites. Blogs may be one of the most simple and most powerful B2B and B2C website solutions on the Internet today. With RSS feeds and world wide subscriber-ships, a business can stay in contact with their customer base. I am testing a few other items related to subdomains. More to come in the future. I would suggest you try the service out with one of your parked domains. If your business is like most businesses, that have extra domain names, with variations of a business name or even using the .net, .org, .info, .us, or others to test the service out. Domain names are so inexpensive today that it is wise to sign up for another domain name related to what your business does instead of only concentrating on the company name. Get started today. Need help along the way? Professional Web Services can provide you with professional Internet marketing services and Blog marketing services. Contact us for a free Internet marketing evaluation. Jim Warholic, President of Professional Web Services, Inc.